Remarks: Squat cylindrical bottle of clean light blue glass is free blown with horizontally flanged rim. The broad handle is combed, bent at a right angle has five sharp ribs applied to the shoulder. There are five wheel-cut incisions around the body. No pontil mark. 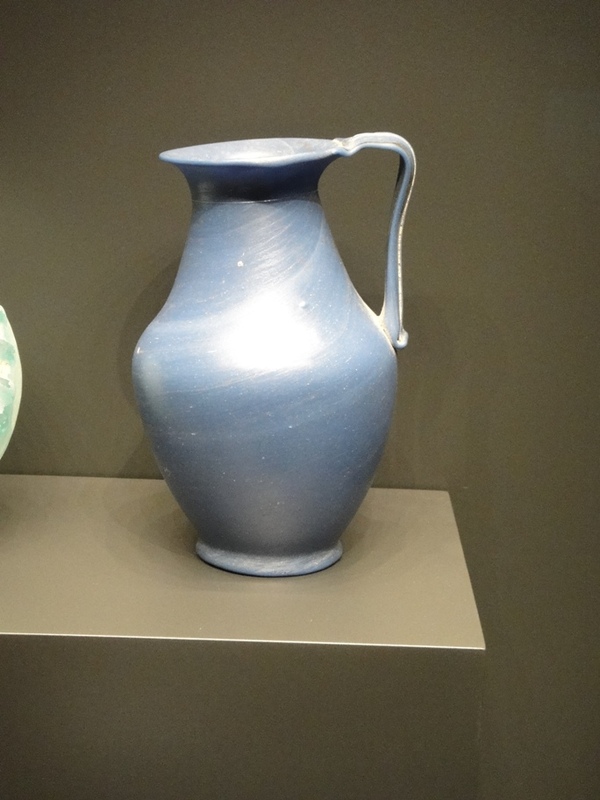 The smaller size of this example makes it rarer than the more common larger jug of the same design. Condition: Intact and in excellent state of preservation. Description: Transparent colorless to purple glass. Elongated ovoid body, blown into a bipartite mold of two vertical sections; body decorated with twenty-five concentric, horizontal mold blown ridges from neck to base. One continuous mold seam around body and base, mold seam is clearly visible. Cylindrical neck with smooth transition to shoulder. Rim folded outward, upward and inward. Two coil handles of cobalt blue glass, applied on shoulder and attached to halfway neck, in a fold. Pointed base. Complete bag beaker, yellowish to light greenish-brown. Slightly everted rim, narrowing somewhat at the neck. Cylindrical body widening before curving into a convex base with a sharp point. It is decorated below the rim with a fine self-coloured trail turned unevenly eight times, ending in a blob. A thick plain trail was turned once round the neck. Eight vertical trails were laid from this trail down to the base. The vertical trails are alternatively indented or plain. The glass is of rather poor quality with many bubbles (several of them up to 13 mm in length). The remains of a punty mark were observed at the point of the vessel. The point and decoration were only slightly damaged in several places. 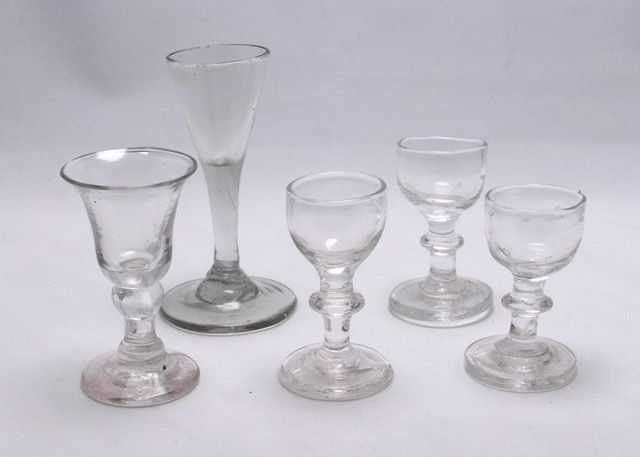 Five miniature glasses, from left to right, # 129, #126, # 127, a, b, and c. The one in the background, # 126, with the slender stem is a two-piece construction from grayish glass, most probably from the Netherlands or Germany mid 18th century. Description as given by Laméris in the catalog “The van Beek collection, Passion for glass”; Miniature wineglass with a funnel bowl above a straight solid stem, a basal knop and a light conical foot. This glass was probably intended for children to play with. Not many of these miniatures are known. Dimensions: ­ 8cm. ; ø foot 4,2 cm. ; ø cuppa 3 cm. ; weight 26,5 grams. Provenance: The van Beek collection, With Laméris. The three glasses to the right #127 a, b, and c are too big to be used as doll’s house glasses. It could be that these glasses were either used by adults in a kind of drinking game as these glasses compare in a certain way to “Schnaps” glasses, or by children imitating the drinking “games” of the adults. Regarding form and shape these glasses compare, in a way, with Lauenstein glasses. These glasses have what I would call a rounded bucket bowl and are of a two part construction. The stem drawn from the cuppa material having a so called bladed knop. Origin: most probably Germany second half 18th century. – 127a; ↑ 5cm. ; ø foot 3,2 cm. ; ø cuppa 2,7 cm. ; weight 21,8 grams. This glass has a quite hefty foot with a protruding pontil, explaining the higher weight. – 127c; ↑ 4,9 cm. ; ø foot 3 cm. ; ø cuppa 2,7 cm. ; weight 18,2 grams. Provenance: – The van Beek collection,with Laméris. Glass # 129, Recently acquired and on the left of this picture. This glass compares regarding use to the above mentioned glasses. However, until now there is, at least to my knowledge, no conclusive evidence to the use of these glasses. Origin: most probably French, end 18th, beginning 19th century. H: 15.9 cm. Dmax:10.2 cm. Drim: 7.6 cm. Dbase: 5.2 cm. Weight: 209 gr. Condition: Repaired from fragments with areas of restoration. Technique: Body free blown. Foot and handle applied. 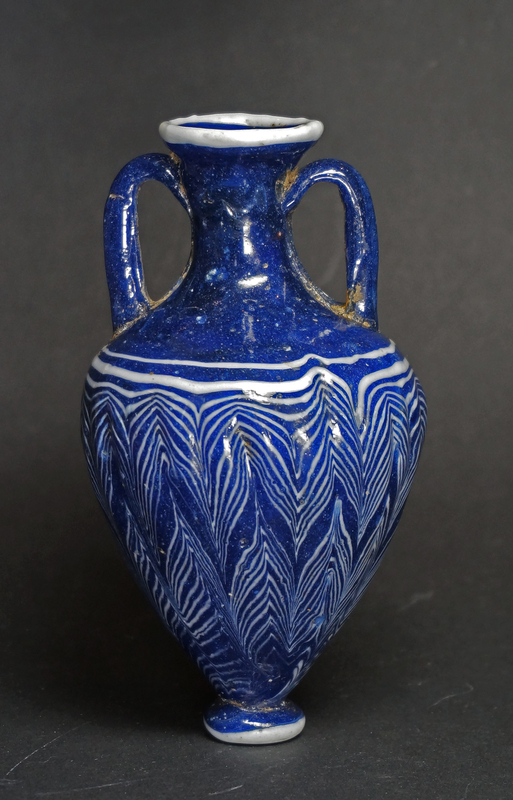 Description: Opaque cobalt blue glass with a swirling grain pattern of lighter blue. Flaring rim rounded and thickened in flame. Short neck tapering to and merging with upper body that strongly widens towards the shoulder. From the shoulder the body rounds gently towards the bottom, giving the jug a bi-conical appearance. Conical ring foot and handle applied. Wide attachment (4.7 cm) of handle to the rim. From attachment the handle narrows towards the angle and further down, broadens towards attachment to shoulder, folds into a fine tapering trail back up the middle of the handle to the very top at the rim. Remarks: Only one, almost identical parallel in glass in known in the J. Paul Getty Museum, object number 2003.476. 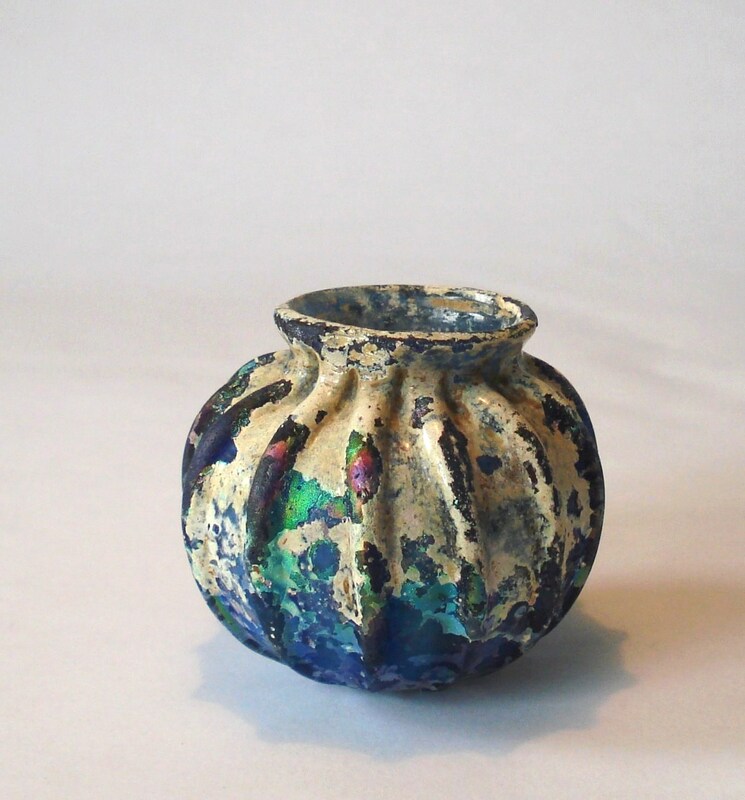 This jug was earlier in the Constable Maxwell Collection (1974-1988) and the Erwin Oppenländer Collection ( 1988-2003). Metal jugs of this form were rather common in Pompei in the first century AD. Provenance: The David and Jennifer Giles Collection, London, UK.,The Hans Lutz Romanowsky Collection, Berlin, Germany, 1984. ,Arete Ancient Art Gallery, Zürich, Switzerland before 1984. References: Wight 2011, J. Paul Getty Museum, p. 116., Sotheby 4/5 June 1979, Constable Maxwell Collection, No. 110.
circa 5th century BC. 11.4cm high. Remarks: Probably from Italy. This color mix is often associated with Tuscany. Provenance: Elie Borowskis prior to 1979 and after that date in the collection of James Stirt of Vevey, Switzerland. Mid to late first century AD. Northern Italian. H: 11.7 cm. Dmax: 6.2 cm. Drim: 3.2 cm. Dbase: 3.9 cm. Weight: 55 gr. Classification: Isings 1957: Form 15. Goethert-Polaschek 1977: Form 133. Condition: Excellent preservation. Some burst bubbles in patches. Technique: Free blown. Handles applied. Description: Transparent colorless glass with opaque blue, white and yellow patches. Ovoid to nearly spherical body rests on a low folded foot with a concave base. No pontil mark. Cylindrical neck splaying and merging to body. Flaring mouth with infolded rim. Two slender bifurcated trails of light blue glass applied to the shoulders, pulled up and bent to attach to the neck just below the rim, creating delicate handles. On one side the trail continues down the side of the neck while on the other side the trail has opaque white streaks and is attached somewhat higher along the rim as well as just below it. The amphoriskos is decorated with random splashes of opaque white and light blue glass with a few blobs of yellow to enliven the design. 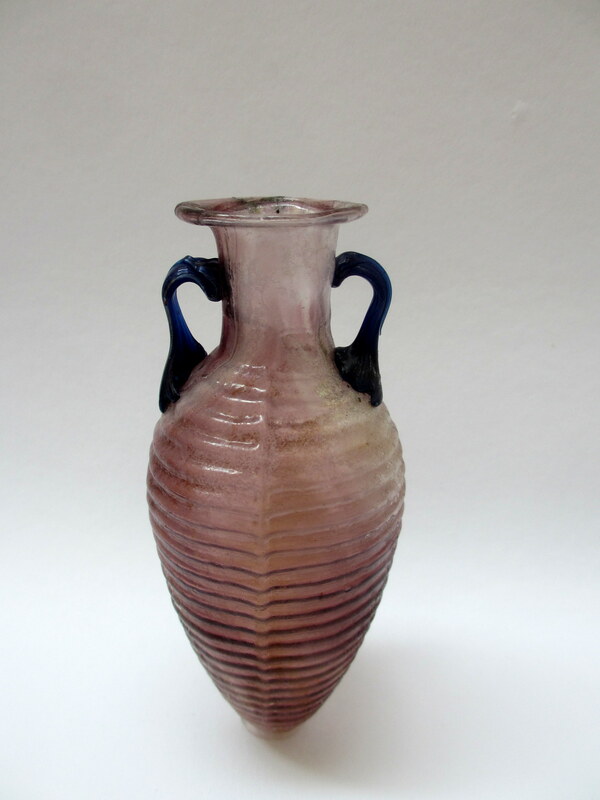 Remarks: This type of glass was in peak production during the Julio-Claudian and Flavian periods. According to Isings production started between 20 and 50 AD and it lasted until the end of the first century. Find spots are all around the Mediterranean sea, the majority of which is concentrated in Northern Italy and adjoining regions. How it was made: The speckled effect on the glass was created by rolling the partly formed vessel on a marver with randomly placed fragments of colored glass. After reheating and rolling the fragments flush, further inflation would enlarge and distort the flattened fragments, giving the glass a multicolored appearance. It has been suggested that this technique was developed to imitate the more costly mosaic glass. Provenance: Aphrodite Ancient Art, New York. Private collection D.S., New York. , Fortuna Fine Arts, New York. , The Martin J. Wunsch Collection, New York, 1980-2016. , Christoffer Sheppard Collection, London, before 1980. References: Whitehouse 1997, Corning Museum, No. 361. Biaggio Simona 1988, Museo Civico e Archeologico di Locarno, No. 19. Kunina 1997, Hermitage Collection, Nos. 187-189. Saldern 1968, Museum of Fine Arts Boston, No. 23. Saldern 1974, Oppenländer Collection, No. 391 (now in the J. Paul Getty Museum). WHAT IS SPANISH GLASS ? Spanish Glass is an historical period of glass with a distinct look mainly made in the 16-17th centuries. Glassware has been made in Spain from the Roman and Medieval eras. Here we feature glassware from Spain mainly made in the 16th and 17th centuries in many glass works throughout the country. These were principally in Catalonia, Castile, Andalucía and the Royal Factory at La Granja De San Ildefonso. Spanish glass from these areas show Moorish influence and later that of Venice, and to a limited extent Bohemia, but local styles were developed making it quite unique. The examples shown here are from The Metropolitan Art Museum and the Allaire Collection. In addition to the Met’s collection there is another fine collection of Spanish glass in New York City at The Hispanic Society of America. Remarks: The shape of this delicate bowl with 13 vertical fine ribs may imitate a melon or squash. 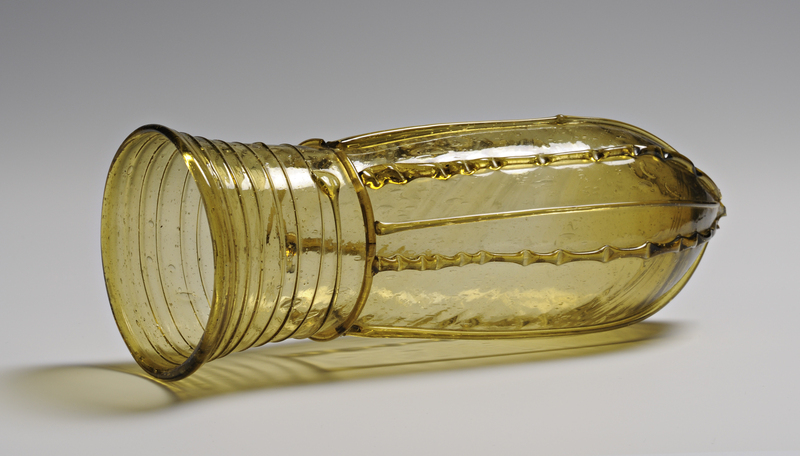 Melon-bottles have mostly been found with a handle and were blown in an a mold. Intact.